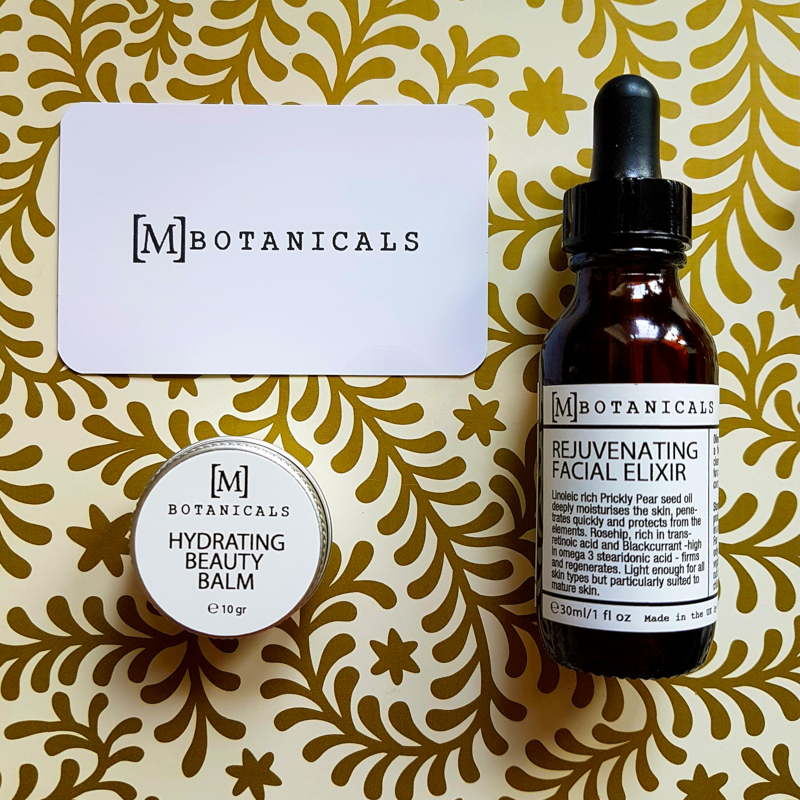 The MBotanicals skincare and candle range is the brainchild of 43 year-old Rebecca Wright. Rebecca’s lifelong love affair with skincare began as a teen, she loved using Body Shop products and felt inspired by founder Anita Roderick. Later she adored Aveda’s range in particular their scents, but since they were too pricey she decided to indulge in a little self care and DIY beauty. An amateur aromatherapist until her early 30’s, Rebecca’s love of scents flourished. Whilst on maternity leave with her first child Rebecca got serious about formulating and over the next few years she gained Diplomas in Aromatherapy, Therapeutic Massage and Aromatherapy Massage. The Rejuvenating Facial Elixir is a light weight but potent oil. A clever combination of ingredients work to moisturise and revive dull skin. Prickly Pear Oil is high in antioxidant Vitamin E which fights against pollution and the stresses of city life, it’s also high in essential fatty acids which means it penetrates the skin and moisturises without leaving it oily. Not only does Rosehip oil hydrate, it’s packed with Vitamin A which can even out skin tone whilst the essential fatty acids in Evening Primrose soften and moisturise the skin. After cleansing and toning, I use two or more drops at night mixed with a moisturiser and gently massaged into my skin. The scent is both uplifting and calming, a combination of earthy Frankincense, peppery notes with fruity Blackcurrant undertones. I wake up to beautifully smooth, plump and hydrated skin. Just a dab of this ultra-creamy Hydrating Beauty Balm banishes dry patches. I use it sparingly when my skin is feeling a little parched, usually after too much sun worshipping or a day spent tinkering in the garden. On freshly cleansed skin, I dab a small amount onto dry areas around the nose and mouth, just a little goes a long way. The floral and earthy balm gloriously melts into the skin, creamy cocoa butter and olive wax work to lock in moisture whilst Rosehip oil repairs and hydrates the skin. – How do you source your ingredients? My ingredients come from all over the planet. I love ‘exotic’ ingredients. I am very interested in the healing properties of plants and oils and how they are used traditionally and that is essentially why I chose oils in my products. In the facial elixir; I chose oils that were very light in skin feel and rich in omega oils as those are most beneficial to the skin. Blackseed oil is amazing, it has a very peppery natural scent which compliments the essential oils. But apart from that it is a powerful healing oil, thought to be a ‘cure all’. – According to the Soil Association’s Organic Beauty & Wellbeing Market Report, in 2017 the organic and natural beauty market was worth £75.9 million, up 24 percent on the previous year. Why do you think people are choosing to buy organic or naturally derived beauty products? Honestly, I can only guess; my thoughts are that we are living in a time where everything is fast-paced and we are under a lot of stress. We are using technology constantly, both in work and out – everything about our lives are slowly becoming more and more artificial. People are yearning to get back to nature and to have simple lives. In our big cities it is not always possible so we take nature where we can get it. For the individual; they will use beauty products when they have that quiet time to look after themselves. This is an intimate experience and if the right products are used, can help people be closer to nature. I have a very diverse background, my mother is Yemeni, with Indian and Somalian roots, my father was English. As a result I have used henna, raw honey and ground Sidr leaves for beautification. Using wholesome and natural ingredients was just simply part of day to day life for women in Yemen, in the same way as eating freshly caught fish and using herbs and spices in food – we were not removed from our food or our personal care. In the West, everything is synthetic, and removed from us. – What is your current skincare routine? Do you have any tips or tricks that you’d like to share? Believe it or not, when I was a teenager I would regularly wash my face with Cold Tar Soap and slap some cream on afterwards. When I got to my late 20’s to early 30’s I realised my time was up and had to take better care. Now I keep things simple, mainly because I am busy. I use my Gentle Enzyme Cleansing Clay daily and sometimes I will use it as a mask before washing off. I follow it with the Daily Rejuvenator, it’s light to use but highly moisturising. In the winter or when I have hormonal breakouts I use the Rejuvenating Facial Elixir underneath the cream – regular use of the Elixir will combat any hormonal breakouts – it is for me, a wonder oil. Do you have those moments where you start dreaming about strolling in the Summer sun, when the days are long and lazy. Your skin feels sun-kissed and everything shines a little brighter. Snap back to reality and it’s actually the end of February, the sun is shining, the snow is falling and the central heating is on blast. Which leaves your skin dull, dry and pasty! 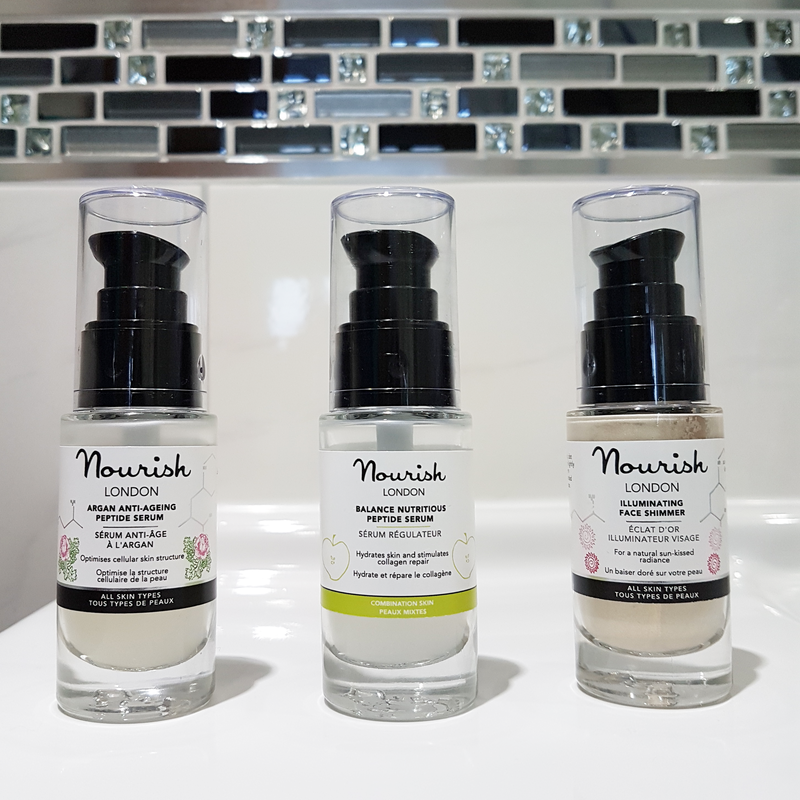 For the past month I’ve been trying out some products kindly sent to me by Nourish London to bring some sparkle back to my skin. Omega rich Macadamia and Pumpkin Oil combine with Rosehip oil to make a luxurious oil which smells like freshly picked roses. I like to use one or two drops mixed in with a light moisturizer for an extra dewy finish. This cleanser comes in an easy to use pump bottle. Superfood Kale detoxifies your skin and fights signs of aging. Like magic, the pearly liquid turns green when you wash your face. The creamy cleanser instantly makes my face feel clean and bright, ready for the rest of my skincare routine. This super hydrating serum glides onto your skin. The zingy apple scent is refreshing and puts a pep in your step. Anti-oxidant vitamins C & E protect your skin from stress and pollution. Just one pump is enough to leave my skin feeling supple and smooth. Golden mineral particles and active Tonka Bean extract give you a natural, healthy glow. Aloe Vera works to smooth your skin and repair damaged cells. I like to dot this Illuminating Shimmer all over my face, focusing on the cheekbones, brow bone and the tip of the nose and chin to make me sparkle like the sun. This potent serum features Earthy Argan Oil which is rich in vitamin E and fatty acids and works to heal and restore the skin overnight. The fresh forest like smell is relaxing. My face definitely feels smoother and more supple since using this and the Balance Serum. 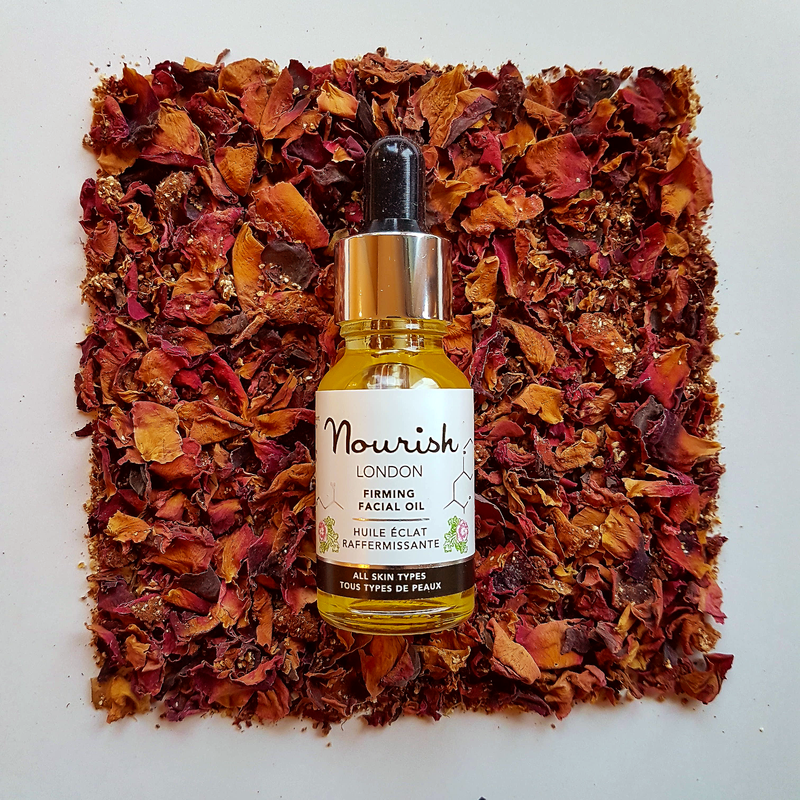 Find out more about Nourish London HERE. Fiovana is the brainchild of David Folkman and Craig Jones, two ex-innocent drinks employees. Spurred on by the fact that water, ‘whilst keeping us alive, just isn’t exciting.’ They decided to create a range of better-for-you cordials blended with superfruit extracts and coconut sugar. Available in an array of interesting flavours including Yuzu, Spanish Lemon and Lucuma, Lime, Mint & Baobob and Blood Orange, Carrot & Maca. David kindly sent a sample of drinks to review. A refreshing and energizing sweet and sour experience, a nice mouth cleanser and pick me up. A tropical explosion in the mouth, with a ripe mango flavour paired with tart, tangy passion fruit. If you’re looking for a healthier alternative to refined sugar, sweetener filled squashes and cordials, try Fiovana’s range of mouthwatering cordials. How do you go about concocting the superfruit flavours? Craig (my business partner) and I used to work at innocent drinks. The then head of product developed, Lucy Thomas, now works with young brands creating new products – Lucy helped develop all our products and came up with the idea of using coconut nectar as a way to sweeten our drinks. What is the most unusual flavoured cordial? People buy our drinks because they’re all quite unusual and not the sort of flavours you find in the shops. I think the most unique is Yuzu, Spanish Lemon and Lucuma, it has two better-for you ingredients that most people don’t know; Yuzu and Lucuma. So we hear the terms superfood/ superfruit a lot; what are some of the benefits of drinking Fiovana cordials over other types of cordial or squash type drinks? We don’t make any claims that our drinks will promote health, by the time they have been diluted with water there’s only a small amount of the good stuff in them. We include the unusual ingredients for two reasons, taste and also to introduce people to better-for-you ingredients that they may not have heard of. Our hope is that they’ll then look for them to include within their regular shop. Compared to other cordials and squash our drinks are significantly better for people in general. We have about no refined sugar and no artificial ingredients that make us unique in the category. Your packaging is beautifully eye-catching. Tell me about how you work with International Artists? Thanks you. Carrying on the theme of being unique compared to other brands sitting on supermarket shelves, we were keen to make sure our bottles look beautiful, almost collectible. We worked with three illustrators to design our bottle labels, one is from London, one from Barcelona and one in Berlin – we took an international approach to make sure we worked with the best European talent we could find. The prettiest postcard. We could all do with getting whisked away for some Winter Sun. Fiovana drinks offer a flexible subscription service, from £9.99 a month for three beautifully designed bottles delivered straight through your letterbox. Find out more about Fiovana cordials subscription service here. I had a chat with Actress Bella Heesom ahead of her show at The Place Theatre in Bedford. You can read our chat here. 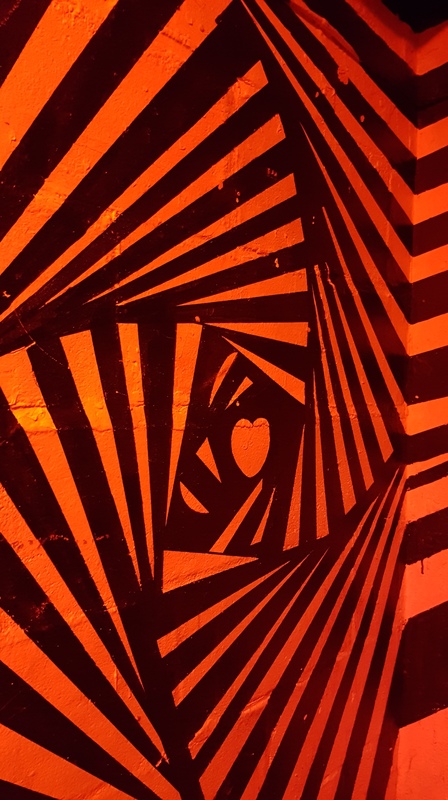 Wandering down the dark stairs at London’s Kamio venue, I was struck by a feeling of dread. Mostly because the walls are painted in a red and black vortex design, which got me thinking what’s at the end of the stairs? I was about about to interview Strong Asian Mothers, ahead of their first headline show of the year. 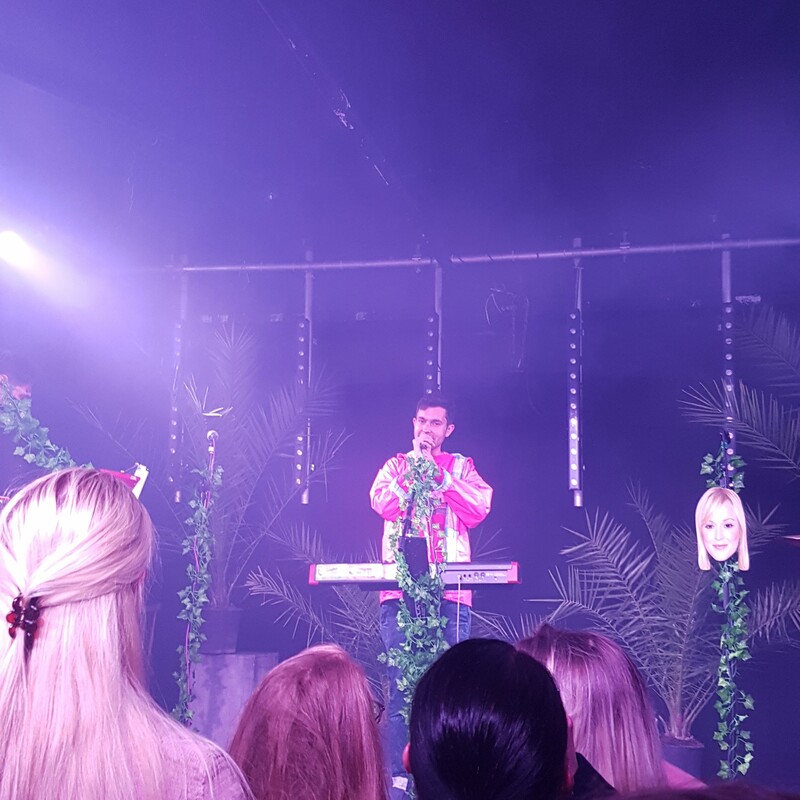 The room was dark but surprisingly spacious, band members, support acts and the backstage crew were busy clattering around onstage. Strong Asian Mothers, released their latest EP, Animal earlier this year. I sat down for a chat with the band whilst they chowed down on Sainsbury’s Finest baguette and tzatziki that might’ve been slightly off. The Animal EP is out now. Doug and Mark Rowe are the kind of food geeks that, “you see in the shops inspecting the ingredients labels on the back of every product.” Hands up if you do the same. The brothers are on a mission to help people cut out the junk and ‘food like products’ from their diets. So they started making Nookie Bars, snack bars without a lot of the usual nasty ingredients – they’re gluten free and dairy free too. There is still CHOCOLATE – CHUNKS OF IT! Doug from Nookie Bar HQ kindly sent two flavours for review. The Peanut Butter and Chocolate Chip bar is smooth and not too sweet plus it has a strong taste of sesame seeds – which I liked, my fussy sister not so much. My personal fave is the dark green Almond Butter, Spirulina and Chocolate Chunk flavour – don’t worry there’s no sign of Spirulina’s pond water smell or taste! (My packet of Spirulina powder is still hiding away in a cupboard. Do I put in food or make a face mask?) It’s a lovely chewy textured bar with an earthy taste and delicious chunks of choc on top. The bars are small but satisfying and make perfect toppings for overnight oats, puds or just munching on the go. Why not try chucking some chunks on top of your morning smoothies or Easter bakes. I had a chat with Doug to find out more. 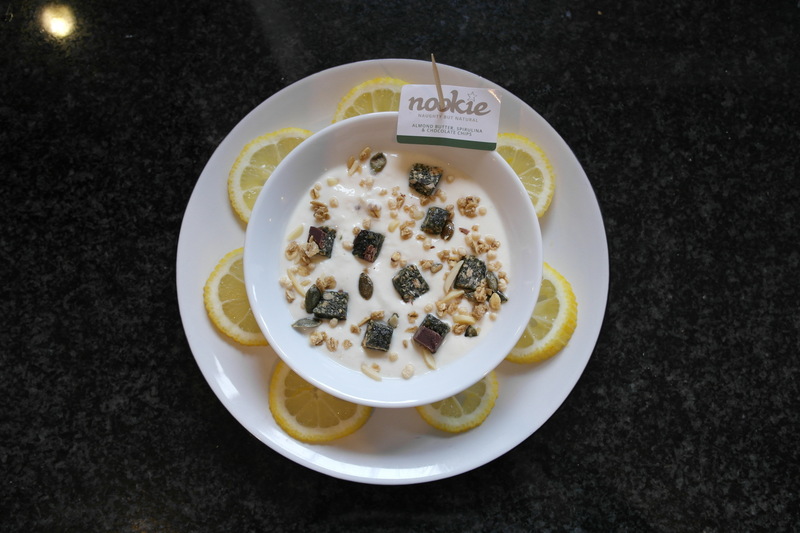 – What inspired you and Marcus to create Nookie Bars? It was Marcus’s work over five years or so prior to us launching. He has always been into clean diets and he wanted to help people have a better option when giving themselves a treat. The traditional confectionery bars such as Snickers – which you will see our peanut bar has a similar taste to – is just full of low grade ingredients. Thus could we produce something that tastes as good but is actually so much better for you. Healthy people are happier people! What makes Nookie Bar’s unique? We believe it is the fact that we have created really great tasting snack bars but without a lot of the nasty ingredients. We’ve also run a chocolate theme through the brand. We conch our own chocolate recipe in London. All of the above comes as well with the bars being gluten and dairy free. If you look at some brands like KIND who have some tasty products that are pretty clean but their third ingredient is glucose syrup. NAKD bars are the combination of nuts and seeds and sell really well but we’ve tried to get a more interesting bite taste. – What are your plans moving forward? We are trying to get in to more retail outlets so that we can grow our customer base. We’ll most likely be looking to add some new flavours to the mix in the second half of the year. And we will also be looking to hire our first full-time member of staff. I’m looking forward to seeing what flavours the Rowe Bros come up with next. Find out more and buy online over at the Nookie Bar website.